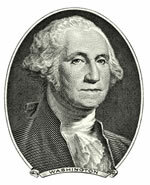 Washington was born back in 1732. A buckle on his shoe. But words were hard to spell. When our country was brand new. Many thanks to Dr. Thomas Moore for permission to display these lyrics. © Thomas Moore. All rights reserved. Used with permission.